Here are some examples of things I would use as a starting point, taken from my own area, London. I offer them simply as stimuli to spark off your own thinking. 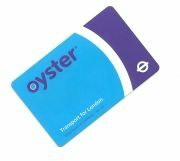 The Oyster card is a pre-paid travel card which records every journey I’ve made. The ticket machines shown here “know” if you have purchased your ticket online, once you have typed in a reference number. Bus stops have numbers. If you text that number to a service known “Next Bus”, you will receive a text message by return telling you when the next bus will be along, and where it’s going. Some bus stops have displays telling you when the next bus is due. Apparently, the bus system in London is the most closely-monitored in the world, with operators able to locate a bus from GPS and CCTV to within a few metres. What businesses are local? Could your pupils work with any of them in some capacity? (Small businesses may be open to suggestions.) Obviously, you will have to take proper precautions in order to ensure pupils are safe. An alternative option would be to think about school visits, or a talk at the school by someone from a local company. Local parks: how could technology be used in such a context? The Dockland Light Rail has trains which work without the need for someone driving it (though they always have a train driver on board for health and safety reasons). There are some more ideas in a blog post I wrote in 2012, Why schools should have a hyperlocal blog.